YellowAirplane.com: The Boeing B-29 Superfortress WWII Bomber Aircraft Books. 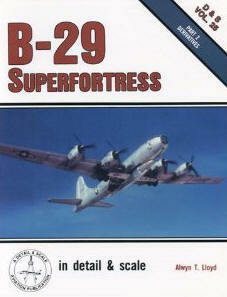 The Boeing B-29 Superfortress WWII Bomber Aircraft Books. In the Prop Bomber Department. El Boeing B-29 Superfortress Aviones de la Segunda Guerra Mundial Bombardero Libros. Boeing B-29 Superfortress, the most advanced WW2 Bomber was used to drop the atomic bomb over Hiroshima. the B-29 made by Boeing and is featured in this book store. This page contains Many Books, Book Reviews, Used Books are available through the amazoneBooks Links. Picture of a B-29 on Ie Shima, Okinawa, WW2. This book store page is super large, Please give it time to load. Fly to the Airplane Books Index . Mann. This book presents an exhaustive, day-by-day chronology of the B-29 Superfortress from the earliest designs of 1934 through thousands of missions and events in World War II and Korea and the 1960 retirement of the last operational ship. Includes an extensive glossary and three appendices, including 1945 radio codes and a guide to (very unofficial) aircraft names. 319 pages, 7"x 10", softcover. Mann. The B-29, which served in bomber, reconnaissance, tanker, and rescue roles, was a crucial tool for U.S. and Allied forces during World War II, Korea and beyond. This operational history provides a general description of the five variants then gives in-depth information on every B-29, including its name and serial number, its history from delivery date to decommission, and its physical characteristics and performance parameters. 288 pages, B&W photographs, 7"x 10", softcover. LeMay & Yenne. 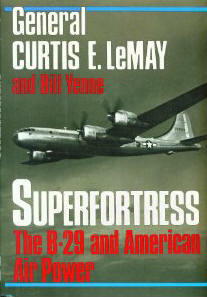 Co-authored by none other than General Curtis LeMay, who led the B-29 into combat during World War II and who headed the Strategic Air Command during the Cold War, this book recalls the early debate about whether or not the United States needed a long-range bomber, how the B-29 was created and produced despite the enormous logistical difficulties of the design, and the decision to conduct fire-bombings against Japan and ultimately drop the atomic bomb. Highly praised when it was first published, this new edition is complete with photographs, a new introduction, and statistical tables. 232 pages, 20 B&W illustrations, 6"x 9", softcover. Tibbets. Autographed by Brig. Gen. Paul Tibbets and "Enola Gay" navigator Theodore "Dutch" Van Kirk, this autobiography chronicles Tibbets' wartime achievements (he was the commander responsible for organizing and training the world's first nuclear strike force and flew the B-29 Superfortress "Enola Gay" on its August, 1945, mission to drop the atomic bomb over Hiroshima), his life after the military, and more. 339 pages, 36 B&W photographs, 6"x 9", hardcover. A B-29 Pilot Captive in Japan. Pickett & Burke. This gripping memoir tells the story of a B-29 pilot shot down over Japan. 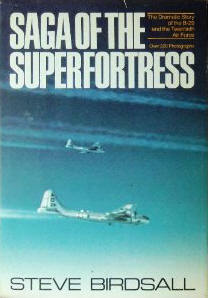 The highly descriptive account includes white-knuckle flying, the little-known story of the early deployment of the B-29 in India and China prior to the establishment of bases in the Pacific, and the recollection of the author's thirteen months of captivity, six of them in solitary confinement. 201 pgs., 17 B&W photos, 6"x 9", hdbd. The Atomic Bomb from the Manhattan Project to the Cold War. Delgado. This book examines the dawning of the nuclear age from the development of "the bomb" through the training of the U.S. Army Air Force's B-29-equipped 509th Composite Group, the attacks on Japan that ended World War II, and the post-war bickering between the army and navy over who would control the technology. 216 pages, 7"x 9", hardcover. Connor & Moore. This lavishly illustrated volume presents stunning close-up photographs of the cockpits and crew stations of 34 legendary World War II aircraft in the Smithsonian National Air and Space Museum's impressive collection. You'll view the interiors of the American P-51D Mustang, P-39Q Airacobra, B-17 Flying Fortress, B-29 Superfortress "Enola Gay," SBD-6 Dauntless, and Boeing Kaydet trainer; the British Spitfire; the Soviet Il-2 Sturmovik; the Japanese A6M5 Zero; the German Fw 190 and Me 262A jet; and many others. 144 pages, 120+ color and B&W photographs, 8"x 10", hardcover. The Story of the Consolidated B-32 Bomber. Harding & Long. Originally intended to join the B-29 in the Very Heavy Bomber role, the Dominator was ultimately overshadowed by her running mate's operational success. Yet 115 production B-32s were delivered to the Army Air Forces, and some did see combat in the Pacific theater in 1945. The little-known story of this large U.S. bomber is told here, from the XB-32 prototype through delivery, combat service, and decommissioning after the war. 58 pages, 60 B&W photographs, line art and more. 11"x 8", softcover. O'Reilly & Rooney. For the 50th anniversary of the Enola Gay's bombing of Hiroshima, the National Air and Space Museum of the Smithsonian Institution produced an exhibit that became very controversial. 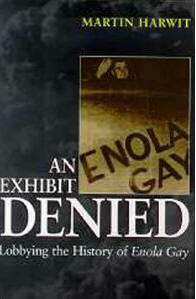 After covering the background of the Enola Gay and its mission, this book focuses on the controversial exhibit including discussions of casualty figures, ethical questions, political correctness and other issues. 255 pages, softcover. Polmar. Filled with many never-before-published photographs, this book examines the B-29 Superfortress Enola Gay, from its dropping of the atomic bomb over Hiroshima through its restoration and exhibition at the Smithsonian Air & Space Museum. You also get insights into Boeing's B-29 program, the combat operations of the type in World War II, and more. 100 pages, 50 B&W photographs, 9"x 7", hardover. A Father, His Son, and the Man Who Won the War. Greene. On the morning after the last meal he ever ate with his father, the author went to meet Paul Tibbets, the pilot of the "Enola Gay." What developed was an unlikely friendship that allowed Greene to discover things about his father, and his father's generation of soldiers, that he never fully understood before. This story of three lives connected by history, proximity, and blood is many stories, intimate and achingly personal as well as deeply historic. In one soldier's memory of a mission that transformed the world lies a powerful tribute to the ordinary heroes of an extraordinary time. This profoundly moving work offers a vivid new perspective on responsibility, empathy, and love. It is an exploration of and response to the concept of duty as it once was and always should be - quiet and from the heart. 304 pages, 6"x 9", hardcover. Krauss & Krauss, ed. Filled with personal reminiscences and photographs of 509th Composite Wing veterans, this heavily illustrated book - signed by Enola Gay navigator Theodore "Dutch" Van Kirk! - presents a fascinating look at the Army Air Force unit that dropped the atomic bombs on Japan in World War II. You'll follow the crews from the unit's formation through training at Wendover Army Air Field and their historic missions over the Pacific. 364 pages, 850+ B&W photographs and an 8-page color section, 8"x 11", hardcover. Heroes and Heroism in American Flight Missions, 1916 to Today. Gilbert. 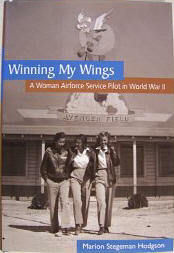 This book recounts the missions of U.S. pilots and crew members who flew above and beyond the call of duty. 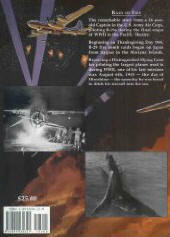 You'll read about World War I's historic bombing raid, flying "the Hump" in the China-Burma-India Theater of World War II, the Doolittle Raid, Col. Paul Tibbets and the Enola Gay, the Berlin Airlift, Vietnam's most concentrated air offensive, the dramatic raids against Saddam Hussein's Iraq, and more. 278 pages, 29 B&W photographs, 6"x 9", hardcover. The Air War Against Japan 1942-1945. Tillman. "The story of how B-29s and lesser aircraft ended the Pacific War is wonderfully told." - The Wall Street Journal. This book tells the complete, awe-inspiring story of the Allied air war against the Japanese homeland, from the audacious Doolittle raid of 1942 through the firebombing missions that incinerated Tokyo and the atomic bombing of Hiroshima and Nagasaki in 1945. 336 pages, B&W photographs, 6"x 9", hardcover. Robinson. Covers 1947 to 1963, perhaps the most colorful period in Air Force history. Here are the bombers of SAC, the fighters of TAC, the transports of MAC, plus trainers and liaison aircraft that were common sights over Europe - B-29s, B-50s, B-36s, B-47s, B-45s, B-66s, B-57s, C-47s, and T-33s. Unit thumbnails are also presented. 50 photos and over 85 color paintings. 32 pgs., sfbd. Gordon & Rigmant. Three Boeing B-29s fell into Soviet hands at the end of WWII, and this book shows the evolution of the copied Tu-4 "Superfortresski" into the Tu-70 military transport and its airliner versions, the Tu-75 and Tu-85. Also described are various experimental versions and Chinese turboprop-powered AWACS and drone launcher conversions. 128 pgs., 120 B&W photos (many never-before published), line drawings, 8"x 11", sfbd. 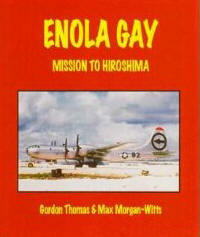 A History and Registry of the Enola Gay and Other B-29s Configured to Carry Atomic Bombs. Campbell. In this history, you'll read of the atom bomb-carrying B-29s' conception and development, the then secret work of the 509th Composite Group, the Los Alamos test program, combat operations, the Air Force bases from which the aircraft operated, accidents, details of atomic bomb types, and more. Also includes a mission list, individual aircraft histories, and many previously unpublished photos. 240 pages, 110 photographs, 7"x 10", hardcover. Kirby. Filled with rare archival images, this photo-history examines the Lockheed Plant in Marietta, Georgia, which has been building many of the world's greatest aircraft for the past 60 years. You'll view the B-29 (modified by Lockheed for the Korean War), B-47 Stratojet (built under license from Boeing), C-130 Hercules, C-5 Galaxy, and F-22 Raptor; meet the people who designed and assembled them; and more. 128 pages, 200 B&W photographs, 6"x 9", softcover. Kirby. This photo-history examining the Bell Aircraft Corporation factory in Marietta, Georgia, during World War II presents rare images of Marietta Army Airfield, the massive plant, the workers who proved to be wonderfully adept at mastering the technical challenges of building B-29 Superfortress bombers, and the transformation of Cobb County from a Depression-wracked backwater to the largest industrial complex south of the Mason-Dixon Line. 128 pages, 200 B&W photographs, 6"x 9", softcover. Robertson, Jr. This fast-paced, riveting account puts you in the cockpit of a B-29 Superfortress for the nonstop bombing campaign that brought Japan to its knees. It's a detailed, mission-by-mission review that begins in the dangerous days of high altitude daylight bombing and progresses to the later nighttime, low-level runs that seemed a whole lot like suicide. 304 pages; 50 B&W photographs, many never published before; 6"x 9"; softcover. Campbell. Filled with rare archival images and extensive photographs of the restored B-29 "Sentimental Journey," this lavishly illustrated book takes an in-depth look at the development and operational use of the four-engine B-29 Superfortress heavy bomber. You'll learn about its bombing campaigns in World War II and Korea, its aircrews and their experiences, and more. 264 pages, 850+ B&W and color photographs and illustrations, 8"x 11", hardcover. The Ultimate Look: From Drawing Board to VJ-Day. Wolf. With information from rare, previously unexplored sources and the most extensive photographic documentation of the B-29 ever published, this book provides a definitive look at the B-29 bomber and its crew, detailing every facet of its development and operational use during World War II. Truly monumental in scope. 272 pages, 500+ B&W and color photographs, 8"x 11", hardcover. Compiled from material originally published in Flight, The Aeroplane, Aircraft Recognition, and The Aeroplane Spotter, this volume includes technical appraisals; handling characteristics; combat and operations reports; cutaway drawings; and insights from the pilots, engineers, and crewmen who knew their aircraft inside and out. 70 pages, approximately 150 illustrations, 8"x 11", softcover. Kaplan. Examine sixteen of the most significant "giants of the air" including military aircraft such as the Boeing B-29, Consolidated B-36, and Northrop B-49; airliners such as the Boeing 747 and Airbus A380; heavy lifters such as the Messerschmitt Me 323 and Consolidated XC-99; and flying boats such as the Dornier Do-X and Martin JRM Mars in this well-researched volume that presents detailed background and technical information, operational histories, firsthand accounts from pilots, plus startling facts and statistics. 320 pages, 30 color and B&W photographs, 9"x 10", hardcover. Harris, Jr. Recording the late-World War II experiences of Colonel Samuel R. Harris, who was a commander of one of the first B-29 heavy bomb groups - the 73rd Bomb Wing - to reach the Marianas Islands in 1944, this diary presents intimate, firsthand accounts of the group's training; its arrival on Saipan; high-altitude bombing and low-altitude incendiary attacks on Iwo Jima, Tokyo, Nagoya, Osaka and other Japanese cities; and more. 264 pages, B&W photographs, 6"x 9", softcover. Savage. Equipped with pressurized cabins for high-altitude flight, an electronic fire-control system, and remote-controlled machine gun turrets, the B-29 Superfortress was the most advanced bomber of World War II. This volume gives you an up-close tour of the heavy bomber and its systems, which played a key role in defeating Japan and ushering in the nuclear age. 80 pages, 210 color and B&W photographs, 11"x 8", softcover. Dorr. This book explores the history, technology and crews of the B-29 Superfortress in the context of its service in Korea. Classified as a very heavy bomber and known as an intimidating giant of the sky in WWII, this propeller-driven craft was re-classified as a medium bomber in Korea and crewed by WWII veterans recalled to duty to face the nimble Soviet MiG-15 jet. 96 pages, 70 B&W photographs and 39 color profiles, 7"x 9", softcover. Doyle. Filled with rare archival images, this photo-history examines the B-29 Superfortress - a four-engine heavy bomber, which, first flown in September 1942, was employed in the firebombing campaign and atomic attacks against Japan - from its design and development to its production and missions in World War II and the Korean War. 88 pages, 248 B&W and color photographs, 11"x 8," softcover. Lambert. 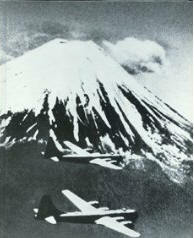 These pictorial studies of the Allied air offensive that defeated Japanese air forces in the vast Pacific Ocean region, destroyed Japan's navy and its supply lines, and finally devastated the war making potential of the Japanese homeland feature photographs from official archives as well as from the private collections of veterans. The captions were painstakingly researched to supply date, place, and units engaged. 128 pages with 200+ photographs per volume, 8"x 11", hardcover. This final volume describes the final air assault on the Japanese homeland by B-29s, island-based tactical air forces, and the aircraft carrier armada of Task Force 38. See items 21046 and 21047 for the rest of the series. Sakaida & Takaki. "B-29!" No other term struck such terror in the hearts of the Japanese public during WWII than this single, most-hated name. The men whose task it was to shoot down the Boeing bombers soon became known as the elite of the Japanese Army Air Force. This book traces their combat careers in the skies over Tokyo, Nagasaki, Hiroshima and Kobe. 128 pgs., 40 color & 100 B&W photos and illus., 7"x 9", sfbd. Discover how a young man from the Adirondack Mountains became a pilot in World War II. Learn how exciting and deadly living on the edge can be, and how, in the end, only a true love and children can complete a man. All the links and stories to a man's past have died away. The papers are left to him from an era he only saw from the eyes of a youngster. There is an unanswered question to his family history in a missing airman. The fifty-seven years that have gone by without answers must end. We have the technology! B-29 The last flight of 428 is the beginning of the question. Where did this plane go? The second of the Legends of the Air series which narrates the operational and development histories of the most important strategic bombers of WW2. Features of Legends of the Air Volume 2 include approximately 70,000 words detailing the three famous bombers, 48 specially commissioned color side view drawings, specification and production tables, maps of areas of operations, and hundreds of photographs. Boeing made reality the operational concept of strategic bombing with the B-17 Flying Fortress. In combat, the B-17 had to fight a difficult battle to prove the concept of daylight bombing. In operation through the darkest hours over both Europe and the Pacific, the 17 became the hallmark bomber of WW2 and paved the way for not only for its peers but its successors. England meanwhile had in the Lancaster possibly the finest strategic bomber of WW2 on a payload/range basis and chose a different operational path than the Americans in optimizing their aircraft for night operations against Germany. The development and operational record of this fine aircraft is fully detailed and backed up by a plethora of never before seen photos and specially commissioned artwork. The famous B-29 Superfortress is presented here in this all new collection of World War II and Korean War era photographs. Many of the 850+ photographs appear here for the first time and are identified as to unit and location. John Campbell is also the author of Consolidated B-24 Liberator, and Talisman: A Collection of Nose Art The famed B-29 is presented in this new collection of WWII and Korean war photos. Many pictured here for the first time and identified as to unit and location. 264 pgs., 850 plus photos, 8½"x 11", hdbd. A reprint of the official government handbook designed to show the new cadet how to fly the aircraft. Heavily illustrated with all the data. 8¼"x 10¾", 88 pgs., sfbd. This title is currently out of stock. However, you can order it used now. 37 plan sets. A collection of the best WWII Warbird plans from Model Airplane News. 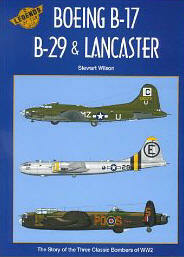 Includes the B-17, B-29, B-24, Catalina, Spitfire and more. You also get background photos and specs, plus a section on WWII color, markings, insignia designations - with date period. 148 pgs., 8½"x 11", sfbd. Martin Harwit's An Exhibit Denied is a cautionary tale about what happens when politics intrudes on the objective quest for truth. The year 1995 marked the 50th anniversary of the flight of the Enola Gay, the plane that dropped an atomic bomb on Hiroshima. In preparation for that anniversary, the Smithsonian Institution's National Air and Space Museum began work on an exhibit that would not only reprise the events surrounding the bombing, but would also examine the bomb's impact on people--both Japanese and American, civilian and military. Under the guidance of Martin Harwit, a former professor of astrophysics at Cornell University, the planned exhibit included, among other things, Japanese civilian artifacts from the bombing and documents showing that high-ranking military leaders such as Dwight D. Eisenhower had grave doubts about dropping the bomb. Most controversially, the exhibit did not support the commonly held belief that the bombing saved countless lives by preventing a land invasion, and this is what eventually led to its downfall. Harwit pointed out that there was no way of knowing how the war would have ended without bombs; the American Legion national commander demanded that President Clinton shut the exhibit down. Marion Hodgson was one of the first women in the United States to train as a military pilot in the Women Airforce Service Pilots (WASP) program. McGill. Often mentioned only briefly in historical records, the USAF 307th Bombardment Wing's flight of October 23, 1951, resulted in the highest percentage of U.S. bombers ever lost on a major mission. In this volume, you'll learn details of that mission, meet the few survivors of the 307th who flew their B-29s into MiG Alley, and learn how that day forever changed the conduct of strategic aerial bombardment. 224 pages, 65 B&W photographs, 6"x 9", hardcover. An hour and a half before sunup, nine B-29s of the 307th Bombardment Wing lifted off from Kadena Air Force Base, Okinawa on a bombing mission against Namsi, a North Korean airfield under construction in the heart of MiG Alley. Five and a half hours later they would engage in an air battle that would forever change the conduct of strategic aerial bombardment. Six of the nine would not return, the highest percentage of United States bombers ever lost on a major mission. Astonishingly, virtually nothing has been published about this event. Official Air Force historical records mention it only in passing and literature of the period too often emphasizes the gung-ho aspect than the grim reality of war. 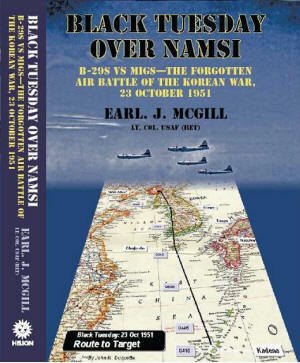 Black Tuesday Over Namsi chronicles the calamitous B-29 daylight-bombing mission flown by the 307th Bombardment Wing on 23 October 1951 against Namsi Airfield. What many experts consider the epic air battle of the Korean War and perhaps the greatest jet engagement in the history of aerial warfare has largely become another forgotten battle in a forgotten war. Here, Lt. Col McGill presents the facts and circumstances of the mission from first briefing to final landing. This book also records, from verifiable historical documents, the broader events and conditions that led up to the confrontation, plus the firsthand accounts of aircrew members and ground personnel who were there. Allied and Soviet perspectives are examined; statements made by the MiG pilots describe the attack; and eyewitnesses to the event have supplied over a hundred photographs of the mission and its aftermath, including Soviet gun camera shots and the aerial photo of the Namsi Airfield that was used to plan the mission. This thoroughly researched narrative history is enhanced by numerous photographs, a bibliography, and an index to full names, places and subjects. This is the story of the Americans and Russians who clashed in the skies above Namsi, the events leading up to it, Black Tuesday's historical impact on aerial warfare, and, for the first time, fresh conclusions based on a careful analysis of the specific factors that went into the execution of this and other bombing missions. This new, improved hardcover edition contains additional narrative and over five times as many photos as the original paperback. The Three Wars of Triple Air Force Cross Winner Jim Kasler. Luckett & Byler. This is the first biography of Col. James Kasler, who served as an 18-year-old B-29 tail gunner in WWII, became a legendary jet ace in Korea, and was so famous in Vietnam that he was known by name in the White House. The only three-time recipient of the Air Force Cross, the second highest medal for wartime valor, Kasler is a hero who has earned the respect of such men as John McCain and James Stockdale. 320 pages, 6"x 9", hardcover. Click Here for the Official Home Page of the Hog Wild B-29 Superfortress over Korea, another, but super secret, Gary Powers incident. Tells the detailed design, development, and combat history of the most impressive bombers of WWII: the B-17 Flying Fortress, the B-24 Liberator and the B-29 Superfortress. From the European to the Pacific theaters, follow along as pilots and crewmembers recall their fascinating, hair-raising tales. 432 pgs., 350 B&W and 125 color photos, 9"x 10½", hdbd. The Superfortress was the most complicated and expensive weapon produced by the United States during World War II. Nearly 4,000 B-29s were built for combat in the Pacific theater, including the Enola Gay that dropped the first atomic bomb over Hiroshima. Reveals technical and financial gambles on the part of the manufacturers. 41 photos, 7½"x 9", 128 pgs., sfbd. Combat diaries of B-29 crews over Japan. Collected intimate accounts and gripping recollections of the incendiary raids, dogfights with Zeros, mine-laying and night-fighter missions, and the atomic bombings. Spellbinding text. 225 pgs., 216 photos, 7"x 10", hdbd. WWII photographer Jack Delano photographed the crews, their environment, and their aircraft on the ground and in the air. The exceptional photography, combined with Ostman and Colles detailed text, provides a behind-the-scenes look at what life was like on a B-29 base during the war. 52 B&W illustrations, 96 pgs., 8¼"x 10½", sfbd. The Superfortress in WWII and Korea Thompson & Marshall. The B-29 Superfortress was the only American heavy bomber to participate in both WWII and the Korean War. This incredible photo combat diary shows the B-29 in both scenarios: against a failing Japanese air force, and against ultra-fast and dangerous Russian-built MiG-15 jets. Includes hundreds of air-to-air shots, battle damage, paint schemes and markings, famous planes and air crews, Air Force bases and more. 160 pgs., 460 B&W and 120 color photos, 7"x 10", sfbd. Reprint of the official Airplane Commander Training Manual for the B-29 Superfortress. Forward section provides development background, serial numbers and specs. 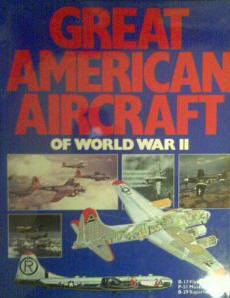 Includes hundreds of diagrams, photos, charts and tables -- everything you need to fly and command a Superfortress! 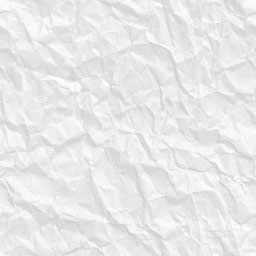 175 pgs., 8 ½" x 11", sfbd. Davis. The B-29 was designed to meet a U.S. Army request for a bomber that flew as fast as a fighter and twice as far as other long-range bombers. And what a great design it was! Here is the B-29 story with 3-view drawings, 10 color profiles, and 140 period photos. 57 pgs., 11"x 8¼", sfbd. The B-29 Superfortress can truly be called the miracle aircraft of World War II. No other major combat model had as short an interval between first flight and first appearance over enemy territory - 20 months. Learn about the aircraft that achieved that record and how the feat was accomplished. Includes 3-view drawings, cutaways, and 130 photos. 100 pgs., 8½" x 11", sfbd. Martin W. Bowman. Here is the early history of U.S. air power, from its inauspicious beginnings as the Army Aviation Service to its victorious achievements in WWII. Focusing on the aircraft and the men who flew and serviced them, book features a wide range of different types, from the DH-4 to the B-29. And with more than 200 photos and detailed captions, its a vivid insight into the rapid development of the world's most formidable air force. 160 pgs., 7¾"x 10½", hdbd. The reality of service as a B-29 tailgunner on 21 firebombing missions over Japan. Bailing out, being rescued at sea, being a true-blue teammate in a bomber crew, fighting and dying together, and answering the question; why do men risk their lives knowing they may not return alive. 23 photos, 156 pgs., 6"x 9", sfbd. 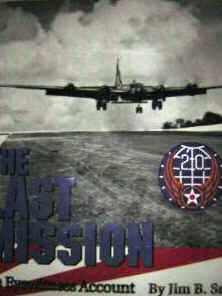 History of the B-29, Wilbur H. Morrison. This is a look back at the B-29's use in the Pacific during WWII. From the birth of the Superfortress, to China-Burma-India operations, to Tinian and the end of the war, the B-29's use and effectiveness are clearly documented in a highly readable and entertaining way. 400 pgs., 25 photos, 8"x 10", hdbd. A comprehensive look at the plane that devastated the Japanese home islands from China to the Marianas Islands. 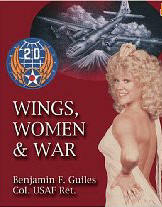 Includes the history of this formidable plane and individual histories of the bombardment groups of the 20th Air Force. In addition, special stories and many incredible photographs help tell the story of the 'Superfortress'. 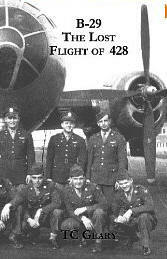 A chapter includes biographies of the men involved in all aspects of the B-29. 128 pgs., 8½"x 11", hdbd. The last military officer to command an atomic mission as the pilot of "Bockscar," the B-29 that dropped the atomic bomb on Nagasaki, the author has the unique distinction of having been an integral part of both the Hiroshima and the Nagasaki bombing runs. This book chronicles the months of preparations, the setbacks, the secrecy, and the snafus of these missions that changed the world forever. 290 pgs., 5¼"x 8", sfbd. A Visual Encyclopedia Sharpe, Scutts & Marsh. Country by country, aircraft by aircraft - from the awesome Boeing B-29 Superfortress to the Japanese Yokosuda MXY-7 - this magnificently huge and visually splendid encyclopedia presents all the planes that waged deadly battle in the skies during WWII. Through a combination of large-size contemporary color and original black and white photography, the ever-changing strategies and course of the air war from 1939-46 emerges, accompanied by each plane's specifications, speed, size, histories, and the clashes in which they participated. 512 pgs., hundreds of photos, 9"x 12", sfbd. The Obsessive Quest for the Lost Aircraft of WWII Hoffman. This retelling of the attempted salvage of the Kee Bird, an almost undamaged B-29 that crashed in northern Greenland, is an epic tale of unbelievable risk, tragedy, heroism and obsession. It details the strange hobby of recovering fabled World War II warplanes and the detective work, engineering and money required, as well as the select group of fanatics spearheading these projects. 288 pgs., 6½"x 9½", hdbd. B-29 Superfortress "Hog Wild" flies over North Korea, Search for North Korea's Atomic Bomb. The WW2 Flying Fortresses coming home with their dead and wounded. Those B-29 engines were remarkable. I witnessed a B-17 flying out of Guam returning from a bombing mission over Japan. It was making an emergency landing on a captured airfield on Okinawa. It hit the runway ok but then it broke into a big ball of fire. I never did hear what happened but scuttlebutt had it that there were no survivors. From what I saw I never doubted this scuttlebutt. I think it would have been better if they had crash landed in the ocean but I have the benefit of hindsight. My grandfather was a Captain in WWII Army Air Corp. flying as a bombardier on the B29......I am looking for any pictures or info that might lead me to some history on his unit. The plane that he rode was called the "Man O War" and I need pictures and or info on this plane and is it on display somewhere etc........Captain Edward Sowers was his name. He has been dead for 1 year now and I am curious to find some information about him, he never spoke much about any of it. Any information you could provide would be appreciated. We found the plane in Nebraska at the SAC Museum. But we still need information. A couple of years ago someone retrieved a B-29 from the China Lake restricted area. It was displayed at the InyoKern Airport near Ridgecrest. I went by there the other day and the site was vacant. Do you know where this B-29 went? I understood that it was the only flyable B-29 except for the FiFi owned by the CAF.